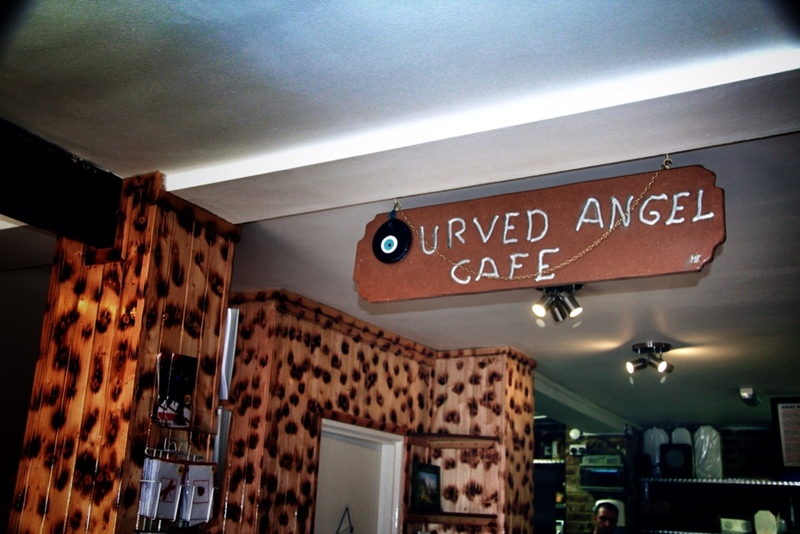 Lunch today was at The Curved Angel Cafe. My flatmates and I stumbled upon it as we walked around Clerkenwell Green, an area just a few minutes walk to the south of our flat. We were looking for a fairly cheap lunch adventure, and the prices listed on a sidewalk billboard fit the price range we were seeking. We ordered our food at the counter and went out to our table to wait. The staff and proprietor were incredibly friendly and helpful, and were kind enough to even pose for a photo for me. I ordered The Curved Angel Wrap for £5.95. My flatmates also ordered wraps, but of different varieties. I was expecting something pretty small for that price in the city. 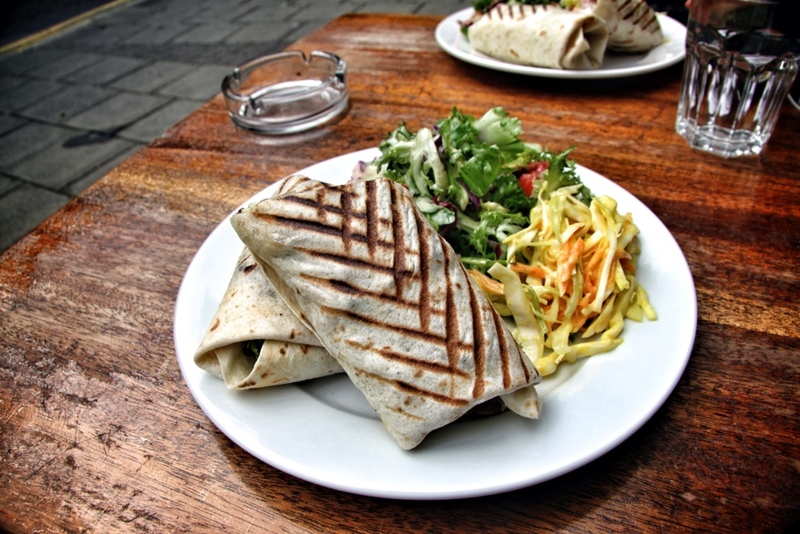 Instead, we each received a substantial wrap accompanied by some coleslaw and a great little salad, artfully arranged on a clean white plate. We were blown away by the humble cafe's presentation even before we took a single bite. However, as the eating commenced, we became so immersed in our respective wraps and sides that the conversation stopped. My wrap had chicken, halloumi cheese, roasted peppers, and greens in it. The chicken was nice a smokey, freshly grilled, and hot; the halloumi cheese worked as perfect complement, with the natural saltiness of the cheese pulling out and accenting the chicken's flavor. The vegetables were also quite fresh and springy, giving the wrap a crisper bite. All of this was held inside a fresh tortilla that was piping hot on service. The food came fresh from the cooktop, and I opted to actually start with the sides. 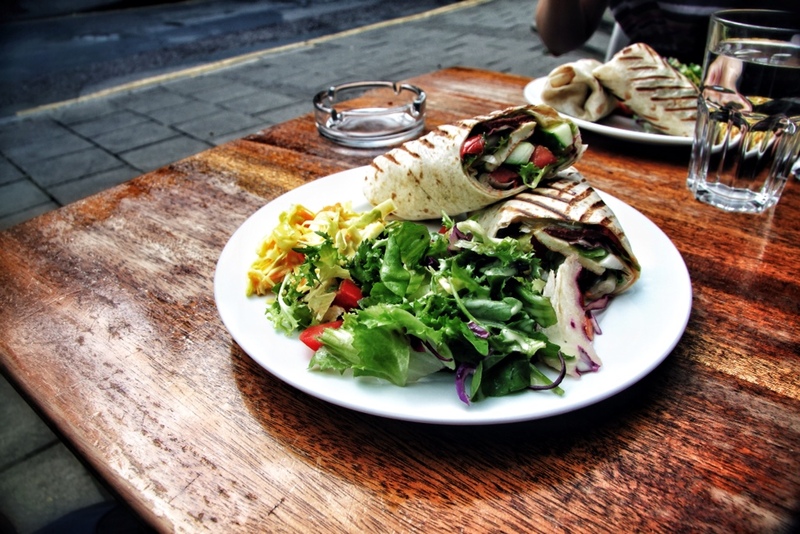 The slaw and salad, like the greens in the wrap, were very obviously fresh and tasted so refreshing. The dressing on the salad, a house blend, was like a creamy italian with a touch more vinegar and very tasty. To top off the great food and friendly service, we had some wonderful atmosphere. 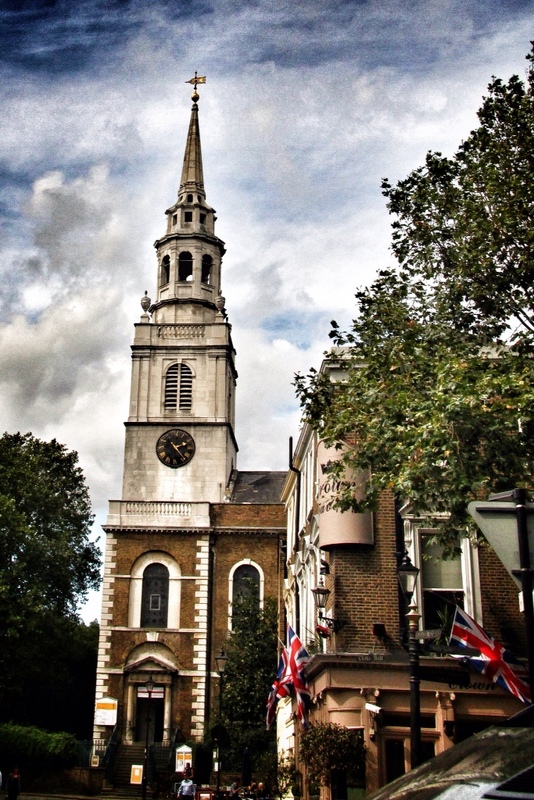 The area were we sitting was right by Clerkenwell Green (the actual park) and a church. We were in the fresh air, with very little traffic, and a great view. With the delectable dining experience, excellent company, and the view you see below, all combined with the excitement of really BEING in London, our flat's first experience at The Curved Angel Cafe could best be described as… heavenly. Eric – You are so right! Sounds “heavenly!” Just remember, too much time spent in the company of “Curved Angels” can be additive (not a typo)! Perhaps that is how cherubs get plump?